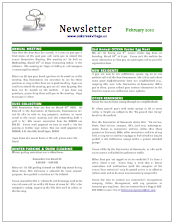 Our subdivision only publishes newsletters and notifications on our website? Click HERE to sign up and receive our e-news updates. Oak Creek Village's (OCV) family friendly subdivision is an excellent place to call home. Here is some basic information that you may find helpful - if you can't find what you're looking for, feel free to ask a question by emailing Briden Management at bridenmanagement@aol.com. Not only are we located in South Lyon's highly acclaimed school district, we have one of the district's best elementary schools right in our backyard (Sayre Elementary-your kids can walk to school!) Additionally, the middle school is right around the corner (for more information about South Lyon schools, click here). The downtown area of South Lyon is just a short walk or bike ride away. For a great shopping experience, a quick bite to eat, or any of the other happenings in downtown, just start exploring - you won't be disappointed. via a convenient connector path that leads to miles of scenic trails. Hop on the path to enjoy an ice cream treat in downtown in the summer, ride your bike to a South Lyon High School sporting event, or walk your way to good health. Other nearby conveniences include gas, grocery, and pharmacy options at the corner of Pontiac Trail and Nine Mile. For updates on subdivision happenings throughout the year and to receive our electronic newsletters, please click here to be added to our community e-News updates list. We will only email you with pertinent updates and will not spam you. The OCV Annual Meeting is held annually in March at Sayre Elementary School. A presentation is given of the past years news and financial facts. This is also when board positions are voted on and filled, so come to listen and voice your opinions. If you want to be involved in voting for the important issues that directly impact the community, please do your best to attend. The OCV annual dues are due on March 31st. Please make sure you are paid in full at this time - watch your mailbox for the annual dues notice mailed at the end of February. All additions, decks, fences, etc. that require the City's approval first must be approved by the Architectural Control Committee. More information and directions for submission are located on the "Forms & Publications" page. Please download the ACC form, complete it and email to bridenmanagement@aol.com. Trash and recycling bins are picked up every Tuesday morning. To reference what items are acceptable to put in the recycling bins, please reference the Messages page topic covering "All Things Recycling Bins". If you did not receive a recycling bin when you moved in, please contact the South Lyon Department of Public works at (248) 437-2326. Watch for OCV tent signs at each of the entrances for important announcements involving your community throughout the year. This is by no means a complete list of services within the community, but a good starting point to begin your search.